Butterbean's pedigree shows him to be 1/2 South African, 1/4 Landcorp, and 1/4 African Goat Flock. He was born on December 10, 1996, and we purchased him on December 16, 1997. We used him on our Spanish does that year, and he produced 2 doe kids for every buck kid. 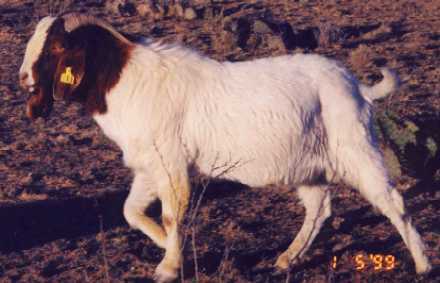 Altogether he sired 38 kids, and as of May 1999 we still had 21 of his offspring in our herd. We traded him on April 14, 1999.